Or you could paint the cat on the table. I am thankful for every frightened cat who finally finds a place of comfort in my home. On our American Thanksgiving I am grateful for my ability to see inspiration just about everywhere I look, and something beautiful in everything I see, and to be able to create things with images and words that can share that inspiration and beauty with others. I am grateful to have the means and the ability to help others in many ways, and I am equally grateful for those who remember me when I have needs too, especially when my car is off the road, a pretty regular theme lately, and especially for those who offer me a space at their table on a holiday. Have a beautiful day, even if you’re not celebrating our Thanksgiving! 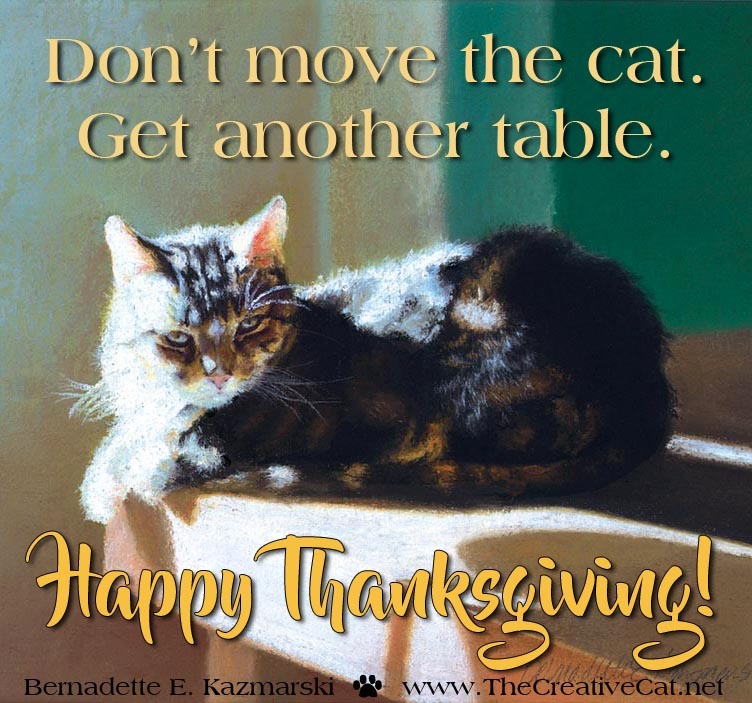 My felines and I wish you a very Happy Thanksgiving! This entry was posted in Uncategorized and tagged thanksgiving on November 22, 2018 by Bernadette. 1 Comment on Happy American Thanksgiving! I am thankful for my cats…I would be lost without them…I am thankful for my latest rescue Oscar…Giving him a warm home and love and he gives that love right back to me…I am also thankful to you for sharing your talents and advice with us…and for sharing your feline family with us…they make me smile…Happy Thanksgiving!